Like a lot of things that come from religion, fasting has often been received by the scientific community with skepticism. And one cannot blame anybody f0or questioning anything that comes from organized religion, but this also means that not everything is based on superstition and irrational theories. Before we started thinking about our biological health we took care of our spiritual health, all thru the ages of the development of human civilization a healthy soul was the ultimate goal of life. The present has a different view of this thing and although a lot of people still take care of their soles most of us think about our health more often. Most people will associate fasting with Christianity, but this is not an exclusive phenomenon that one encounters only in these religions. Besides Cristian’s, there are other cultures and religions that call for different types of restraint in food consumption. Either in one period of the year or all thru the year. The most extrema version of fasting is asceticism and not many people choose to go on this path. It is a total renunciation of all worldly pleasures. One intentionally starves himself to the brink of death and keeps living in this state till they feel they have to. This is an extreme, but I am mentioning it because I want you to get a clear picture of the many different approaches one can have too fast. Other popular forms of fasting include restraining from certain foods for a special period in a year like Christians do before ester or Muslims do when it is the time of Ramazan. Modern believers often change these old rules and adapt them to be more suited to a modern and urban lifestyle, some do it the old way. After trying fasting myself I thought about the effect it truly has on my body. I asked the question am I getting healthier or actually harming my self by doing this? Before I give the answer, I should also mention that I fast once a week. That’s how I chose to do it. Keeping yourself hungry for a long period of time is warry bad for your health. Your muscles can start to deteriorate and your organ functions will slow down. Generally, it can harm your metabolism and shorten your lifespan. But, this is the extreme form of fasting. 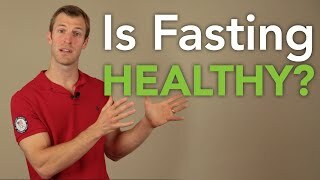 Scientist have looked at the influence periodic fasting has on the organism and on your health and the conclusion are not so bleak. What did they discover? The fact is that our digestive tract doesn’t like to be full of food all the time. This is something that harms its efficiency over time. This is why it is good to restrain yourself from eating highly caloric food once a week or a couple of days a month. This is just enough time for your stomach to rest and for your body to clear itself of the access energy you take in every day.